Databases can be one of the trickiest components to deal with when trying to automate your deployments. In this post, I'm going to walk you through one approach to tackling automated SQL Server database deployments. This isn't the only way, but it's a way that has worked well for me for years. Number 4 might sound surprsing coming from me, but actually, one of the goals of Octopus Deploy is that the packages you create ought to be useful on their own, without depending on Octopus. That is why Octopus uses standard conventions like web.config files, appSettings, XML transforms and PowerShell. In the worst case, you could rename a NuGet package to a .ZIP, extract the files manually, invoke the scripts manually, and you are deployed. Octopus just exists to make it easier. A couple of years ago I blogged about the philosophy behind how I approach database migrations, and I'll be following that here. Before we can even begin to think about automated deployment, we need to get the database under control. We're going to be using a change script approach to managing deployments. For example, imagine that Sally wants to add a column to a table. To do this, she might use the designer in SQL Management Studio to add the column and generate a script (there's a button in Management Studio to do that). Or she might use a tool like Red Gate SQL Compare to help create the script. Or, she may know T-SQL well enough to write it by hand. Whatever the process used to create the script is irrelevant. The important point is that there will be a script. The script describes how to get the database schema (and data) from one state to another. That script should go in source control. This would get saved as a file on disk, named something like Script0091 - Add phone number to customer.sql. Notice the number in the name; that's because migration scripts always need to be run in a specific order (if one script added a column and the next one renamed it, it wouldn't make sense to run them out of order). The next step is to run those scripts automatically. You have a few different options here, and again, none of this is Octopus Deploy specific - you ought to be able to handle database deployments without depending on Octopus Deploy. One option is to have a PowerShell script that takes the scripts, sorts them, and passes them to the SQLCMD utility to be executed. Another option is to use open source tools like DbUp or Tarantino, or even commercial tools like SSW SQL Deploy. I'll use DbUp in this example, because I think it's the simplest tool. It does this by using a SchemaVersions table to track what scripts have been run. You can customize this behavior using the DbUp API, but I think it's a good default. This also makes for a nice developer experience - other developers on my team can get latest, and run the console app to update their own local copy of the database. We don't need to use shared databases anymore to stay in sync. Let's review what we have so far. We have a set of scripts that describe how the database needs to be changed. We have a console app which runs those scripts. The console app gets it's connection string from a configuration file. None of this depends on Octopus to run, and if we had to, we could run the scripts by hand (or ask the DBA to run them for us). 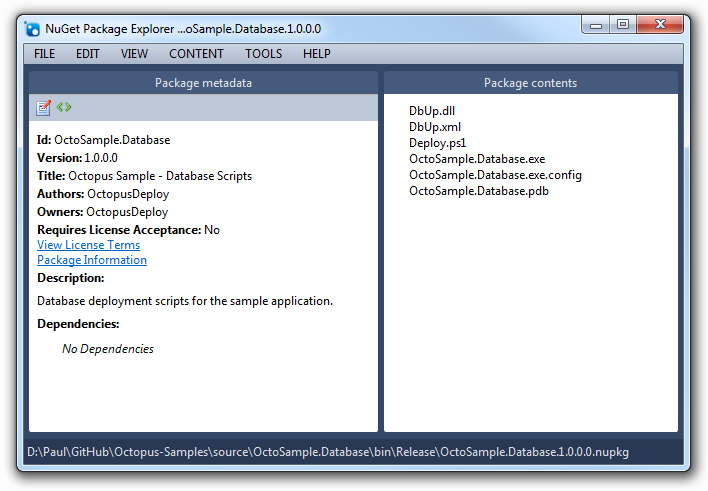 All that is left to do is to package everything into a NuGet package so that Octopus can run them. Next, under Variables, I'll configure a variable with the connection string for each environment. Octopus will automatically update the connectionStrings section of the app.config file with these settings depending on which environment I deploy to. And there you have it - automated database deployment with Octopus Deploy. In this post I demonstrated one technique to achieving automated database deployments using Octopus Deploy. There are plenty of other solutions, and if you are using Entity Framework or NHibernate these tools have migration support built in, but the core approach will be the same.